When in Sri Lanka, one of the bucket-list experiences is definitely to go on a jeep safari to one of the national parks! I visited Yala National Park and this is a complete review of my tour. When you think about Sri Lanka, chances are high that you immediately think about jeep safaris and spotting wildlife… Well, you’re right! During my week on the South Coast of the country, I had the chance to do a Yala National Park Safari with Cinnamon Nature Trails. Below you can read all about this safari and of course I’ve included everything you need to know to make your own visit to Yala National Park a success. Where To Go In Yala Sri Lanka? Where To Book A Yala National Park Safari? What Animals Can You Spot In Yala National Park? What Is The Best Time To Visit Yala National Park? Where To Stay In Yala National Park? How Long To Visit Yala National Park? Did you know that 13% of Sri Lanka is either a national park, reserve, sanctuary or jungle corridors? The Sinharaja Forest Reserve for example, is the country’s last area of tropical rain forest and it has even been named a UNESCO World Heritage Site! Yala nationalpark Sri Lanka is one of the oldest and most well-known national parks in the country: it was designated a wildlife sanctuary in 1900 and designated as national park in 1938. Under British rule, however, the park was initially used as a hunting ground, if you can believe it! With about 1297 km2 (129,700 ha), it’s also the largest of protected areas in the country. The park plays an important role in the conservation of a large number of flora and fauna in Sri Lanka and you can also find a couple of historical, religious and archaeologically important places in the area. The terrain of Yala park Sri Lanka is very diverse and consists of light riverine, thorn and dry monsoon forests, scrub jungle, fresh and brackish water wetlands, open planes of grasslands, tanks, lagoons and even sand dunes. Special to Yala is the coastal wilderness and it’s the only place in the world where you can see Asian elephants right next to the coast (and sometimes even ON the beach!). What you should know about Yala, is that it’s divided into 5 blocks and also consists of adjoining sanctuaries and national parks such as Lahugala, Lunugamvehera and Kumana National Park, the Yala Strict Nature Reserve and the Kataragama, Katagamuwa, and Nimalawa sanctuaries. Between the different national parks there are jungles, so elephants have corridors to move from Yala to the other parks in the area. Not every block and sanctuary is accessible for visitors (only Block 1 and 5 are open at the moment, the others are more used for research and documentary filming) and -here comes the deal- not every block gives you an equal chance of actually seeing wildlife. Another very important thing to note is that Blocks 1 and 2 will be closed for 6 weeks in September and October. Yala safari Sri Lanka companies will then take you to either Block 5 or Lunugamvehara National Park. Of course, during the time that we visited, the park had literally just closed, so we were off to Block 5, which we didn’t know beforehand. Below you can read the impact that had on our overall experience. Block 1 is the most popular area of the park (in the South) and because it’s one of the oldest, the animals are somewhat ‘used’ to people being around, so you have the best chance of spotting wildlife. This part of the park has the highest concentration of leopards as well (over 30 at the moment), so if you want to see them (and who doesn’t), you have to go to Block 1 for sure. But remember that they are still wild animals, so you might not spot anything regardless. This block is almost exclusively used for safaris, so expect quite a bit of traffic going around. Block 2 is at the most Southern and remote part of Yala. Wildlife here is less frequently observed, and therefore quite shy. Block 3 in the North of Yala features a wilderness with hardly any visitors… and also hardly any wildlife because of the dry Yala weather. That said, in the dry season, this block is where specialized afternoon safaris run to photograph the Sloth Bear. Block 4 of Yala is located in the North. The area is a dry zone and features a tall canopy and forest with huge trees, compared to the more open landscapes in the South and East of Yala National Park. There is a lot of rainfall in this part of the park, almost double than the more Southern parts of the park. Because of the wilderness, there are almost no visitors here and block 4 Yala national park animals are a lot more shy because of that. Block 5 lies in the North of Yala and just like block 3 and 4, there will be not a lot of visitors here, and also not a lot of wildlife because of the dry conditions and the fact that they are much more shy than in Block 1 for example. It’s perfect if you are looking for a private nature experience and are crazy about birds, but definitely don’t expect much larger wildlife, for that you really, really have to visit Block 1. You can see why most people on our tour (who were expecting to see heaps of elephants and perhaps even leopards) were mildly (read: VERY) disappointed that we got diverted to Block 5. At the Wild Yala National Park hotel, we were given the lovely map of Block 1 (see above), with all the animals we could see there… but we never did. We did our Safari with Cinnamon Nature Trails, which is related to the Cinnamon Wild Yala nature resort and is one of Sri Lanka’s leading eco-companies. They have worked together on photo and video productions of no others than National Geographic, BBC Natural History and The Discovery Channel. On our tour, we entered the park around 3 PM (it was about half an hour drive from the Yala Safari Hotel, since we had to go to Block 5 instead of Block 1, which is right next to the hotel) and had to exit the park again at 6 PM. On this tour, they say you get a minimum of 3 hours in the park. There is a maximum of 6 people per Yala safari jeep and no matter where you are seated, you will have a window spot. Well, more a ‘viewing spot’, since there are no windows in the jeep, haha. For an adult, if you’re travelling with a minimum of 2 people, you pay USD $90. Children 5-12 years pay USD $40 (under 5 free of charge). For an adult, if you’re travelling with a minimum of 2 people, you pay USD $180. Children 5-12 years pay USD $60 (under 5 free of charge). Again: make note that in general, Yala National Park Block 1 & Block 2 will be closed from the 1st of September until the end of October. As an alternative the safari will be taking you to either Yala Block 5 or Lunugamvehara National Park. This will GREATLY reduce your chances of seeing larger wildlife. Just so you are warned. In Yala, you can find 44 varieties of mammal and 215 bird species. The animals that most people come to Yala for are the elephant and most of all the leopard. In the Southern Blocks of 1 and 2, and also in the East of Yala, you’ll find quite a large number of lone elephants. For the bigger herds, you have more luck in the Northern Blocks of 3, 4 and 5. There are about 250-300 elephants in Yala, broken up into small families and lone males. Yala has the world’s biggest concentration of leopards, and to see them best, head over to Block 1. There is also a large population of Sloth Bear (they feed on fruit between April and June) and other wild animals such as crocodiles, spotted deer and sambar deers, jackals, peacocks and a lot of other birds, including raptors, waders and shorebirds. How MASSIVE is this bees nest? We didn’t spot any large wildlife in Block 5 until perhaps 10 minutes before we had to leave the park at 6. By this time we were still quite a bit of distance from the gates, and our drivers were rushing (read: definitely going over the speed limit here) to make it back in time. I suppose there is a fee for them if they stay out too late, but they should know by now how big the park is, no? Anyway, when we were rushing through the park, suddenly someone shouted “ELEPHANNNNNTTTTSSS!! !” and we made a sudden stop, almost having the car behind us crash into us. Uhm ok. But there they were…. really far away (I have a 200 zoom lens and then cropped the image below to see things properly). But hey, they were elephants, even with a little baby! The fact that we only got to look at them for less than 5 minutes is something I’m just going to forget. The best time to visit the park is between February and July. During this time, the water levels of the park are quite low, so the animals have to get out into the open to reach water sources. The Northeast Monsoon occurs around mid-October to late-December. During this time, it’s perfect to see the arrival of migratory birds from central Asia and the Himalaya. Because Yala National Park is located in the “dry zone” of Sri Lanka, the climate here is hot and occasionally humid. Average temperatures range between Min 20°C (68°F) and Max 33°C (91°F). During my time in South Sri Lanka, I stayed at the Cinnamon Wild Yala safari lodge. This resort features individual bungalows and includes a lake filled with wildlife from birds to buffalo’s and crocodiles! To read more about this incredible Yala National Park accommodation, check out our complete review here. We spend two nights at the Cinnamon Wild Yala hotel, but we only got to go on just one afternoon safari. If I would have booked this trip myself, I would have definitely stayed another night and try and go on at least one more safari early in the morning! The experience is just too unique to cheap out on this and what are the chances you’ll be back in Yala anytime soon? Also, make sure to get to the opening of the park as early as possible. Especially when you’re in Block 1 and things get busy, you don’t want to be the last car in line! Driving through Block 5, which borders Lunuamvehera National Park, we stopped briefly at the Weheragala Reservoir. This reservoir and dam was built in 2009 to block the Menik Ganga (river) and to provide water to the farmer in the South and the pilgrims who travel annually and seasonally to Kataragama for religious purposes. It also provides drinking water to the wild animals in the park, especially during the dry season. The reservoir can hold 75 million m3 of water and covers 3500 acres! The dam itself is 2 km long, 23 m high and 18 m wide. It’s really quite impressive! If you’re wondering, the national bird of Sri Lanka is a “junglefowl”. It looks like a rooster, but then with gorgeous blue tail feathers and a red and yellow comb. We didn’t spot one of them on our safari, but we did see many other gorgeous birds, that you can see below. If you are a lover of bird watching, perhaps consider to (also) book the bird watching trip to Bundala National Park (about 35 km from the Cinnamon Wild Yala Resort). Cinnamon Nature Trails offers a tour that will take you to the first wetland that was declared as a “Ramsar site” in Sri Lanka and a UNESCO designated biosphere reserve. This park is considered an “Important Bird Area” (IBA) and is home to 197 species of birds of which 58 are migratory. You have the chance to see for example: the Black Headed Ibis, Black Tailed Godwit, Painted Stork, Terns and many other bird species along with mammals, amphibians, butterflies and reptiles. This tour leaves at 7 AM. As Sri Lanka holds the highest density of leopard population in the world, the cattle of local farmers have been under many attacks in the past. The leopards especially prey on their young calves. Of course, the farmers were less than happy about this and their anger triggered many revenge attacks, which in return left the leopards in great danger. That’s when the John Keells Foundation, in collaboration with Cinnamon Wild Yala founded “Project Leopard”. This project provides cattle farmers with steel pens to secure their calves at night, when the animals are most vulnerable. The success of the project paved the way for the “Leopard Research Project” to be initiated. Here, weather proof trail cameras were installed in Yala to monitor the behaviour of the leopards and estimate their population. Besides the fact that we got send to Block 5 and therefore not seeing as much big wildlife as we could have and the rushing of the drivers at the end of the trip, I would still say that my experience going on a jeep safari in Sri Lanka was a positive one. The rush of being in an open vehicle with so many wild animals around, the excitement of spotting really amazing birds, deer, monkeys and in the end (even though very far away) elephants, is something I believe everyone should experience once. One thing that I would have expected more from was the driver/guide on our trip. He did point out some of the animals we saw, but didn’t give us a lot of information about them, as I believe his English wasn’t great. If we would have someone on the trip that was a great storyteller and provided us with a lot of background on the animals and the park, this would have definitely been a better experience for us. If I would ever come back to Sri Lanka, I would 100% go when Block 1 is open and give myself at least 2-3 drives depending on the wildlife we get to see. But overall, I thought this was a really cool bucket-list worthy experience, especially if you’ve never been on a jeep safari before like I have! Definitely in combination with a stay at the Cinnamon Wild Yala Resort, this part of my trip to Sri Lanka has been my favourite and I would highly recommend visiting! Currency in Sri Lanka? Sri Lanka Rupee (LKR). Check the latest exchange rate here. Electrical Plugs in Sri Lanka? 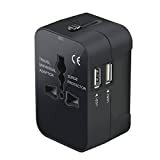 230V, Type D, M & G. We recommend getting a universal travel adapter to never worry about having the right plug on your travels! Best time to visit Sri Lanka? Sri Lanka has warm temperatures throughout the year, but the dry season is from April to October (mild temperatures and little rain). The Monsoon season is from November to March (high temperatures and humidity). Visa Requirements Sri Lanka? If you’re from the USA, UK, Netherlands or Australia, you are required to apply for an electronic visa (ETA) prior to arrival. This visa allows you to enter and stay in the country for 30 days. Vaccinations for Sri Lanka? You should always check your doctor’s recommendations on vaccinations before you travel, but you should definitely have the basic immunizations such as Tetanus and Diphtheria up to date. How to get to Sri Lanka? You can only get to Sri Lanka by flying. There are no ferries between India or other nearby countries. I flew from London with Sri Lankan airlines, as there are daily direct flights from Heathrow to Colombo. This took about 10 hours. While flying economy is always a bit uncomfortable long-haul, I did like the food and entertainment options on my flight and the staff was super friendly. The flight from London was packed, so 100% make sure to book your seats in advance to prevent yourself ending up in middle seats. You can even bid for business class seats, a friend of mine got hers for as low as 100 pounds! For the best deals on flights to Sri Lanka, check skyscanner.com. Colombo to Yala national park is about 285 km, which is around 5,5 hours driving. It is recommended if you’re not seeing anything else on the south coast, to take a flight here! Cinnamon Air flies to the airport in Tissa, which is 53.3 km from the park. One Day in Galle Fort, Sri Lanka? Complete Guide To A Perfect City Break! Cinnamon Sri Lanka Hotel Review: Is This the Best Accommodation on the South Coast of the Country? Watch our whale watching experience in South Sri Lanka on YouTube! Disclaimer: I was kindly invited by Cinnamon Hotels & Resorts, The Professional Travel Bloggers Association, SriLankan airlines and the Sri Lanka Tourism Promotion Bureau to be part of this trip to the South Coast of Sri Lanka (part of TBC Asia 2018). All photos and opinions are, as always, 100% my own! One Day in Innsbruck, Austria? Complete Guide To A Perfect City Break! Previous articleCinnamon Sri Lanka Hotel Review: Is This the Best Accommodation on the South Coast of the Country? Next articleOne Day in Galle Fort, Sri Lanka? Complete Guide To A Perfect City Break!